Vancouver Especially (A Vancouver Special scaled to its property value in 1973, then increased by 8 fold). @ 221a off-site Semi Public. February 21, 2015- February 20, 2016. In his most recent installation, Ken Lum created a scale replica of a Vancouver Special home entitled Vancouver Especially (A Vancouver Special scaled to its property value in 1973, then increased by 8 fold). This project is currently in the Semi Public space, operated by 221a, located at 271 Union Street. Opening on Saturday February 21 2015, the project delves into Vancouver’s historical erasing of minority populations by the development of new architecture and aggressive city planning. Vancouver’s history is one riddled with erasure and displacement of minority populations. From European settlers displacing indigenous populations, the gentrification of the Downtown Eastside, to the current real estate flip occurring in Chinatown, this narrative of capitalist expansion has left many without a space to call home. Each of the populations being displaced is a minority group whose collective space allows for cultural expression. By making use of the family home as a trope to viewers, Lum is pointing to a history of domestic space being an important need to those who make these spaces home. Rachel Whiteread. House. Grove Road London, October 25 1993- January 11 1994. Site Specific Installation. Photo: Sue Omerod. 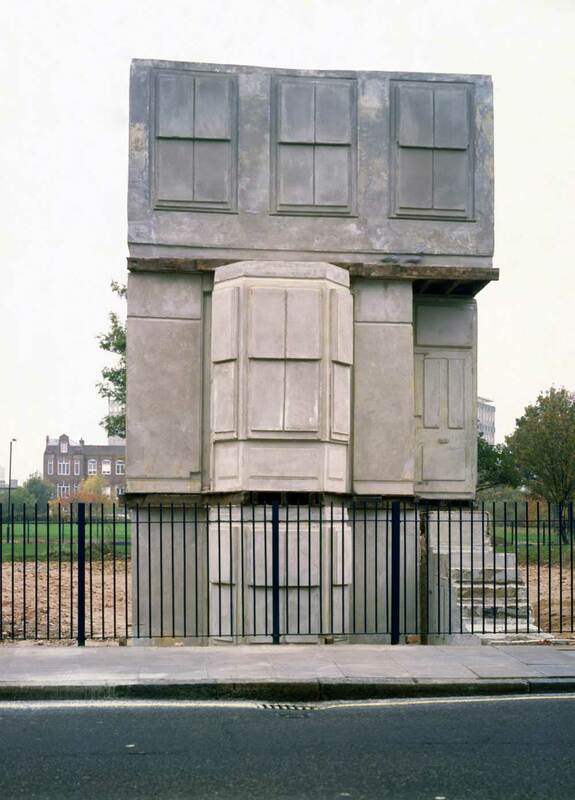 In 1993, Rachel Whiteread won the Turner Prize for her controversial work House. This work also addressed the demolition of domestic space in East London. Her work was a cement cast of a Victorian Terraced house, or row houses that were to be demolished for re-zoning purposes. East London is also an area with diverse ethnicities dwelling alongside each other. Whiteread cast the interior of one of the row houses in cement, making the viewer aware of the physical living spaces that were being demolished in this act. Similarly, Ken Lum, by utilizing monetary value and physical scaling creates a tangible space-value between viewer and the installation. This space-value makes the viewer hyper aware of the value of a living space in Vancouver. 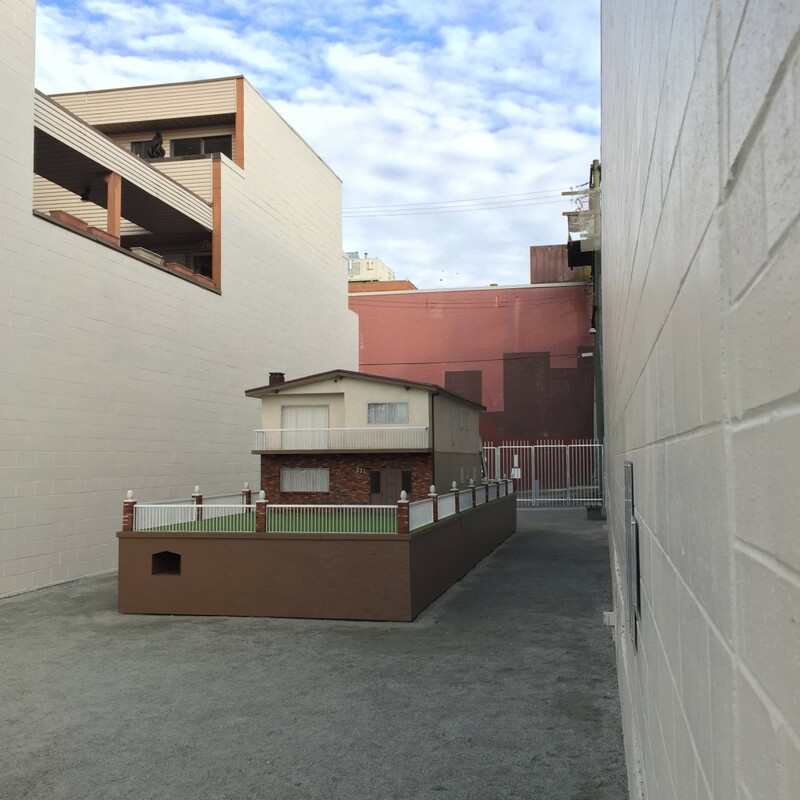 This installation is located in an empty lot between two newer buildings in China Town. The model takes up a chunk of the lot, with space for viewers to walk around and peer voyeuristically into the windows of the house. Set at a value of $45,000.00, the project with out its eight-times increase is barely the size of a dollhouse. Lum created a relief in the model to demonstrate the value of $45,000.00 in 1973 compared to today taking into account inflation and material values. The predominant model is one-third the actual size of a Vancouver Special and this is after an eight-time scale increase. As a viewer you become acutely aware of your body’s space when a living space has been reduced as so. The attached two-car garage is barely big enough for me to fit in, even curled into a child-like ball. I would undoubtedly become stuck like an overgrown child trying to enter this playhouse. The utilization of 3-D space reinforces the monetary inflation and expectation of my generation, some 30 years later. 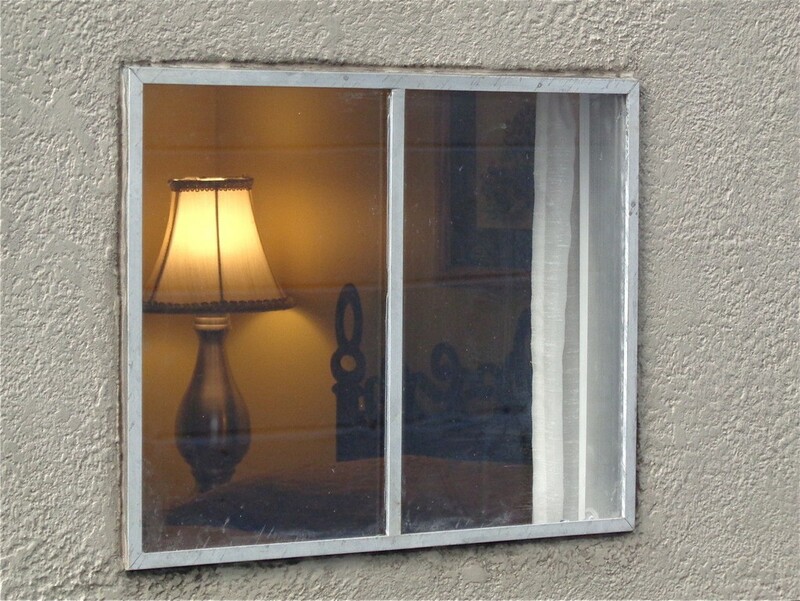 When peering into this house, you can almost smell the musty carpets and feel the fluorescent overhead lighting that most of these houses came equipped with. The Vancouver Special, as they are known, were utilitarian, and were built during a period of mass immigration to Canada, post World War II. Built without architects, they were constructed to serve an efficient purpose of meeting the housing demands created by immigration. Their aesthetic is that of utility and Ken Lum has taken great care to create an accurate representation of the materials and lifestyles that these Vancouver Specials embody. Even the décor is congruent with viewers’ memories of the 1970s and 80s. Vancouver Especially holds an important place in remembering Vancouver’s working class history. Vancouver city planners are all too quick to write history for us. These Vancouver Special homes were built mostly in the suburban neighbourhoods popping up in East Vancouver starting in the 1960s. Keith Higgins, a Vancouver based artist, has been documenting Vancouver Specials on his website. By listing the street names that the Vancouver Specials are located on, it can be seen that a pattern of construction exists in a semicircle around downtown. These homes cost $45,000.00 to purchase, and could be purchased on a working class job’s salary or wage. This is vastly different from the 100 year mortgages offered to purchase a living space in Vancouver today. To buy a single family home in Vancouver today will cost around $1,000,000.00. By using physical scale, Ken Lum manages to create a relationship between viewer and space through means of monetary justification. His success also comes from the placement of this Vancouver relic on historic land that once was Hogan’s Alley. This alley was a space where Vancouver’s African American Population was concentrated before the Georgia Viaduct was constructed. The Jimi Hendrix Shrine, and Hogan’s Alley café are the only remaining markers of this space after its demolition. Lum points this out in his artist statement for Vancouver Especially, bringing attention to another example of displacement that has taken place in Vancouver’s desires to build newness. This installation is successful in bringing attention to the spatial costs of living in a dense metropolitan city such as Vancouver. The Vancouver Special is unique to Vancouver, however the inflation in the cost of living is an issue found in most large cities. This project also brings attention to the need to protect working class areas, as neoliberal land attainment policies have a tendency to see space as its use value, rather than a cultural and historical place where identities are tied. Another example of this is occurring in the Downtown Eastside, where storefronts utilize the façade of historical buildings while building new spaces in behind. This is choosing to show a selective history of Vancouver, one that is far in the past and glorified, rather than the difficult recent past of the Downtown Eastside’s addiction and homelessness issues. Similarly to Ken Lum, Stan Douglas has commented on the gentrification of the area through visual means as well. In his work Every Building on 100 West Hastings, Douglas documents the buildings along West Hastings Street in 2001. Compared to today, these buildings are hardly recognizable having been made into gyms and designer baby clothing stores. Both Ken Lum and Stan Douglas are making important statements about Vancouver’s affordability and displacement of minority groups. It is with art such as this that calls attention to what makes a healthy ecosystem in a city, and one of those factors is affordable housing.